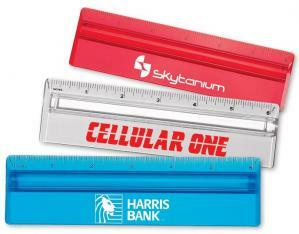 Promotional Items, Inc.™ invites you to select promotional rulers. 6-12 inch natural, Mood, enamel, lacquered wood & plastic rulers imprinted. Promotional rulers are an inexpensive way to get your advertising message across for marketing and promotions. 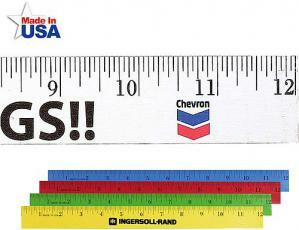 PII features rulers in a variety of sizes, materials, finishes and colors. 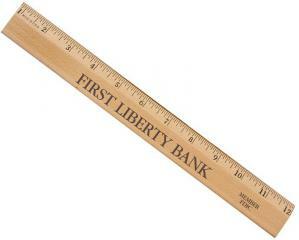 Find 6" and 12" rulers in both wood and plastic. If you are looking for a low cost ruler choose our 6" promotional wood ruler for an advertising ruler or for school promotion. 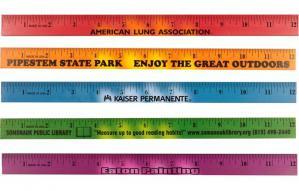 In addition add some fun by choosing printed Mood promotional rulers that change color when warmed by the human touch. Want to step up to a 12" wood ruler? PII has natural wood, colored enamel, mood rulers at the absolute lowest cost possible. 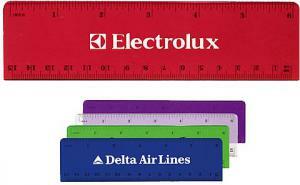 Our plastic rulers in 6 or 12 inches are a beneficial trade show giveaway and double as a useful office or desk promotional item. Looking for a business gift type printed ruler? PII features the solid wood lacquer finish with metal edge 12" Executive Wood Ruler. Scroll down the page to find the Wood or Plastic Rulers you require for advertising gifts at a low cost. 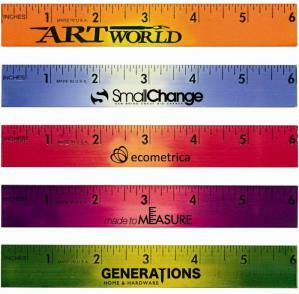 Visit our Yardsticks, Walking Sticks page for additional related measuring promotional items. Buy imprinted 6 or 12 inch wood or plastic promotional rulers for advertising gifts or giveaways. 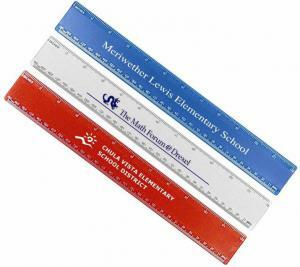 Rulers add longevity to your promotion at a cheap price for school programs and business marketing.